Saint-Denis is the administrative capital (préfecture) of the French controlled island of Réunion, in the Indian Ocean. The city is the largest town on the island. In 2004, it had a population of about 133,700 people. Saint-Denis was founded by Étienne Régnault in 1669. The city became the capital of Réunion island in 1738. The closest airport is Roland Garros Airport which is also the main international airport of Réunion. The Réunion Tram Train is expected to start being built in 2008. It stretches from the city to the airport and to Réunion's second city Saint-Paul. 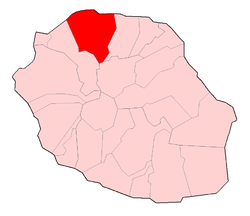 Wikimedia Commons has media related to Saint-Denis, Réunion.